I poco più di venti minuti di “Inside The Head Of Gods” smentiscono in un colpo solo due luoghi comuni applicabili alla musica di Will Thomas Long: la sua necessaria manifestazione nel lungo formato e il carattere acromatico delle sue suggestioni visuali. Le dieci tracce del lavoro sono infatti non solo molto concise, ma sono state create in occasione di una mostra del pittore giapponese Taichi Kondo, un’opera del quale lo identifica dal punto di vista visuale. Di quest’ultimo aspetto il contenuto sonoro è profondamente rispettoso, atteggiandosi a semplice cornice ambientale, spesso appena al di sopra dei limiti della percezione, risultante da un certosino lavoro di manipolazione, aggiunta e sottrazione di timbriche pure che, come pennellate successivamente sovrapposte, formano immagini le cui trasparenze permangono discrete, mai invasive del campo visivo. Così, ascoltate a medio volume e in sequenze anche diverse da quelle dalla playlist, le tracce di “Inside The Head Of Gods” contribuiscono a definire una fruizione sinestetica che coglie l’essenza dell’attimo di un’impressione visiva, rispecchiandone l’immaterialità. ‘I love you so much I can’t even title this’ was recorded in 2008. Inspired by Samuel Barber’s ‘Adagio for Strings’, some of the notes were replayed incorrectly, and processed on tape and a laptop. The title came alluded to a Morrissey song, and she once summed it up by calling it ‘the laziest title I’ve never written’. I remember painting the handmade die-cut sleeves in the garage, having to hold a rag over my nose and mouth to keep out the fumes. At the time, it seemed like an exercise. Studying poetry had distanced us from the world – and did we think anyone was even paying attention, anyway? The theme was overwhelmingly obvious, and the title was direct. 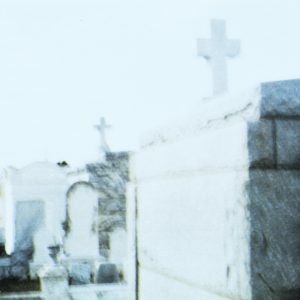 A few years later I chose a photo for the cover of a cemetery in New Orleans – another direct message, yet like everything else, entirely unintentional. You’d be surprised how beautiful the cemetery was that day in the sun, and how you’d probably be wrong about every other assumption, as well. But then, what does that matter, either? Music only has to be. ‘I love you so much I can’t even title this’ is available on 2xLP on sky blue, white, and black vinyl from Infraction. “Akagi” heißt das neue Opus und mit Hilfe von Tante Google erfährt man, dass es sich bei diesem Titel um den Namen eines japanischen Vulkans handelt, der so viel wie “Rotes Schloss” bedeutet und in den 20er-Jahren des vergangenen Jahrhunderts auch einem Flugzeugträger der Kaiserlich Japanischen Marine verliehen wurde, welcher im Verlauf der Schlacht um Midway während des Zweiten Weltkrieges eine zentrale Rolle spielte, die uns an dieser Stelle jedoch nicht weiter beschäftigen soll, schließlich wollen wir es tunlichst vermeiden, vom Höckchen zum Stöckchen undsoweiter zu kommen. Am wahrscheinlichsten ist’s eh, dass es der Vulkan war, der als Namenspatron diente, insofern belassen wir’s der Einfachheit halber dabei. Im Rahmen des, von WILL LONG höchstselbst verfassten Promotextes erfahren wir überdies zweierlei: Zum einen, dass er die Musik auf dem Album – ein einziges Stück von knapp 80 Minuten Länge – für ein “live yoga event at Yougenji temple in Northern Tokyo” eingespielt hat, wo sie quasi als Soundtrack fungierte und auf das anwesende Publikum eine extrem beruhigende bis einschläfernde Wirkung ausübte. Zum anderen, dass ihn selbst diese Musik an seine selige Großmutter sowie die Wärme und Ruhe erinnert, die sie ungeachtet der Bettlägerigkeit ausstrahlte, welche sie in den letzten Jahren ihres Lebens erdulden musste. In diesem Zusammenhang scheint es denn recht naheliegend, es könnte sich bei jener älteren Dame, die auf dem Frontcover zu sehen ist, wie sie, angetan mit einem blauen Kleid, mitten auf einer Schotterpiste im Wald an einem blauen Auto lehnt und freundlich in die Kamera winkt, um ebendiese LONG’sche Oma handeln. So viel zum thematischen Hintergrund, der zugegebenermaßen irgendwie diffus und ein bisschen beliebig bleibt. Doch das ist halb so wild, denn kommen wir zur Musik, so kann die deutlich kürzer abgehandelt werden. Wenn man nämlich eines mit Fug & Recht sagen kann, dann dieses: “Akagi” ist ein absolut typisches CELER-Album, wie der Mann schon Dutzende und Aberdutzende unter die Leute gebracht hat. Und auch, wenn der Rezensent grundsätzlich durchaus mit musikalischer Monotonie nebst endlos kreiselnden, an- & abschwellenden Drones und Soundflächen im allgemeinen sowie CELER im besonderen sympathisiert, so muss an dieser Stelle rigoros Klartext gesprochen werden: Angesichts des, von dergleichen meditativem Gesumsel aus sämtlichen Nähten platzenden CELER-Backkatalogs ist “Akagi” – man entschuldige die deutlichen Worte, doch hier sind sie unumgänglich – überflüssig wie ein Kropf. Es mag ja sein, dass WILL LONG hier, wie er im Promotext ausführt, allerlei technische Innovationen aufgefahren hat – am Ergebnis ändert das wenig bis gar nichts, denn der Sound ist exakt derselbe, wie man ihn von -zig anderen seiner zahlreichen Veröffentlichungen kennt. “For this I created a new piece of music using two reel-to-reel tape machines, and two tape loops of keyboards with similar time structures, but each with different, overlapping chords”, so LONG. Und weiter: “They played simultaneously, crossing in different combinations, and with manual alterations of the volume and high/low settings on the machines.” Man möchte entgegnen: Das ist ja alles gut und schön, Herr Musikant, am Ende steht dann aber doch einer jener endlos langen Einschlafdrones, wie CELER sie seit Jahren produziert. Und irgendwann wird das selbst dem erklärtesten und wohlwollendsten Freund der Wohnzimmertapetenmusik ein wenig zu fad, zumal, wenn die Soundemissionen derart inflationär den Markt fluten. Celer‘s ambient music is a quietly stirring dream that flutters around the eyelashes of reality. By now, ambient listeners should be well-acquainted with the hushed, introspective music of Will Long. Inside the Head of Gods is barely there itself, its short, organ-led pieces painted with loving kindness. The shapes and tones are similar throughout the record, creating an absorbing album that congeals rather than dislocates. Introverted notes mix in with the rumbling swells that linger in the background, and gradually this painting – this work of art – comes to life. The tones may be similar to one another, but in a way they’re also vastly different to each other. The same colours enter a million and one paintings, but each painting is unique. The words and letters in the English language are constantly recycled; they all use the alphabet, but novels are never identical. Sure, the words are the same, but the sentences, chapters and overall narratives are very different. Of course, the same is true in music. For example, the notes in a pentatonic blues lick can be rearranged a thousand times, despite its supposed 5-note limitations. But it can still sound fresh. And so it is with Inside the Head of Gods. On the surface, there doesn’t seem to be a lot happening here. That’s fine – it’s ambient music! It just has to be. Made to accompany the paintings of Taichi Kondo for his exhibition ‘What’s my name?’ at Finale Art File in Manila, Philippines (April 6 –April 30, 2016), Inside the Head of Gods is an introverted, subjective listen that absorbs into the very room. After sifting through many different layers, tones and timbres, Long eventually settled on one 20-minute piece of organ music. And it fits. As Long says himself: ‘Like the paint on a canvas, it’s all made of paint’. The music fits the contemplative and reflective space of a gallery, but the music also rises up on its own two legs and can be appreciated with no other artistry in sight. After all, ambient music, and Celer’s music in particular, is a painting of sound. Vapours of steam rise up, shaping the notes gently until they resemble the fine, glassy curves of a Coca Cola bottle. These are subtle variations on a beautiful, almost poetic theme, and Long did the right thing in shining a direct light on one particular aspect of the sound. These vignettes swirl in the air as they wrap their ghostly arms around the listener. The muted, dry tone is suppressed rather than suffocated, and the organ’s shuddering, all-consuming, cataclysmic vibrations have been filtered. As a result, it’s a little weaker, but this lets the thinner ambient tone inside, and the swells still have the ability to produce aftershocks when they rise up. The tonal similarities keep the music consistent, and its artistic merit shines through. Inside the Head of Gods is a place where everything is different, but nothing has noticeably changed.